As a new arrival in Dubai or even as a seasoned expat having lived in Dubai for many years when it comes to choosing the right curriculum for your child it can be overwhelming as school and their curriculums have probably changed a lot since you were at school. So here is a brief explanation of the various international curriculums you will see on offer at schools in the UAE. The curriculum followed by schools in England and Wales to students aged 5 to 16. The National Curriculum is organized into blocks of years called ‘key stages’. There are four key stages as well as an Early Years Foundation Stage (EYFS). The EYFS covers education for children before they reach five (compulsory school age). For each National Curriculum subject, there is a program of study with all students studying a common core of subjects consisting of English, Mathematics, Science and Core PE. In addition, Year 10 students choose further subjects from the option choices presented to them. At the end of Key Stage 4 students will sit exams in the subjects studied in year 10 & 11 for GCSE’s (General Certificate of Secondary Education) and/or equivalent qualifications eg IGCSE (International General Certificate of Secondary Education). GCSEs cover a wide range of subjects and each student chooses several subjects (usually up to 9) to study. Most are expected to take Mathematics, English, Modern Foreign Language and Science. Coursework may count for part of the final mark depending on the subject and syllabus. The curriculum is set by the government but exams and specifications (syllabuses) are sent by individual exam boards. The IGCSE curriculum allows teaching to be placed in a localized context, making it relevant in different regions. It is also suitable for students whose first language may not be English and this is acknowledged throughout the examination progress. IGCSE is equivalent in standard to the English GCSE and is recognized as evidence of ability by academic institutions and employers around the world. On completing Key Stage 4 dependent on grades achieved students can move on to studying for 2 more years (years 12 & 13) to attain qualifications for University entrance such as A’ Levels where a student normally studies between 3 & 4 subjects gaining a grade in each subject. (Some schools have now decided to follow the International Baccalaureate Diploma qualification instead of A’ levels). The Primary Years Program (PYP), for students aged from 3 through 11, offers an integrated curriculum enabling students to learn through guided exploration and structured inquiry. The emphasis is on the education of the whole child: emotionally, physically and intellectually. The Middle Years Program (MYP), for students aged from 11 through 16, builds on from the knowledge, skills and attitudes to learning, developed during the PYP. The program consists of eight subject groups integrated through five areas of interaction that provide a framework for learning within and across the subjects. Students are required to study their mother tongue, a second language, humanities, sciences, mathematics, arts, physical education and technology. In the final year of the program, students also engage in a personal project, which allows them to demonstrate the understandings and skills they have developed throughout the program. Teachers set assessment tasks that are assessed internally in the school. External checks (either moderation or monitoring of assessment by IB examiners) are carried out on this internal assessment to ensure worldwide consistency of standards. For students aged from 16 to 18+. The program is normally taught over two years and has gained recognition and respect from the world’s leading universities. IB Diploma Program students study six courses at (3 at higher level & 3 at standard level). Students must choose one subject from each of groups 1 to 5, thus ensuring breadth of experience in languages, social studies, the experimental sciences and mathematics. The sixth subject may be an arts subject chosen from group 6, or the student may choose another subject from groups 1 to 5. In addition the program has three core requirements that are included to broaden the educational experience and challenge students to apply their knowledge and understanding. Students take written examinations at the end of the program, which are marked by external IB examiners. Students also complete assessment tasks in the school, which are either initially marked by teachers and then moderated by external moderators or sent directly to external examiners. The diploma is awarded to students who gain at least 24 points, subject to certain minimum levels of performance across the whole program and to satisfactory participation in the creativity, action, service requirement. The highest total that a Diploma Program student can be awarded is 45 points. It is worth noting that many of the IB Schools in Dubai are now offering BTEC programmes in subjects such as sports, media, business and tourism for children age 16 plus. Schools offering this program run a standards-based system which parallels the American System, thus allowing students to readily transfer in and out of other US schools. Schooling is broken down into Elementary (K-grade 6), Middle School (grades 7-8) and High School (grades 9-12). Throughout these years a broad breadth of subjects are taught. On reaching grades 11 & 12 students follow Advance Placement Courses (AP). 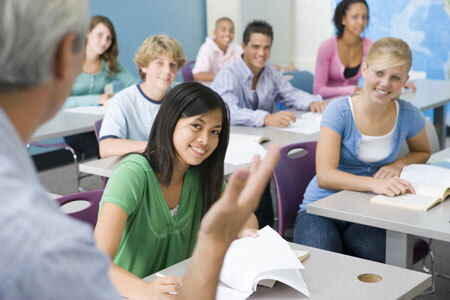 These courses are first year college level courses designed by members of the College Board. Students enrolled in AP courses not only receive a grade in the course but also sit for an external exam in May. The results of this exam could earn students credit at the university level. Schools offering a French curriculum follow the programme of study established by the French Ministry of National Education and are officially recognized by the French government (homologation). The school system is divided into École Primaire (ages 3-5 years), École Élémentaire (ages 6-10 years), Collège (ages 11-15 years) & finally Lycée (ages 15-18 years). The last year of Lycee is called Terminale and this is when a child sits Baccalaureat which determines their university eligibility. The curriculum offered in the UAE comes from the state of Queensland – The Queensland Certificate of Education (QCE) program allows children to pursue the Queensland Senior School curriculum moderated by the Queensland Studies Authority (QSA). CBSE – Central Board of Secondary Education (Indian). This is the governing body for a syllabus with exams at the end of year 10 and Year 12 in Indian curriculum schools. Administered by the CISCE (Council for the Indian School Certificate Examinations) for Year 10 students. ISC is the Indian School Certificate.